Post war East Germany turned up to have the center of SLR camera engineering within its borders, as Dresden came to belong to the east zone. 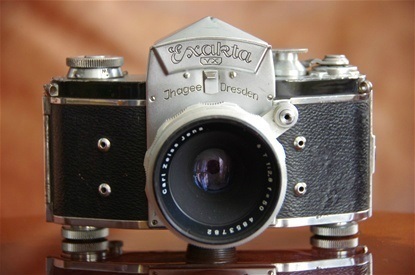 Contax was already on the track of PP SLRs before the World War II, and Praktica and Ihagee were also among the first. 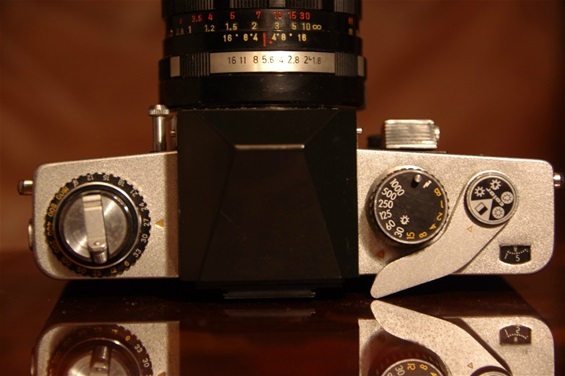 Both Ihagee Exakta and Zeiss Ikon had former owners living in the west. 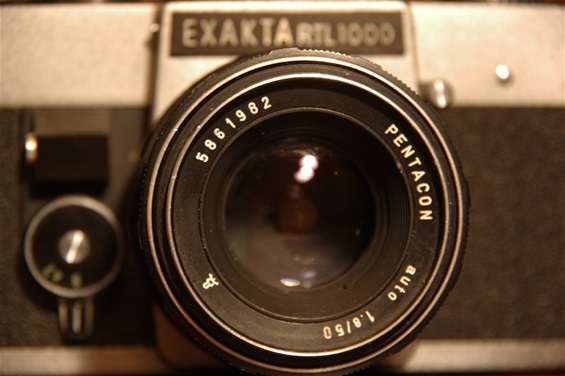 As the east zone Contax met massive obstacles from the west zone part of the company and was forced to change name for export, the DDR leaders phased out the Zeiss Ikon and Exakta, to concentrate on Praktica under the Kamera Werke/Pentacon umbrella. 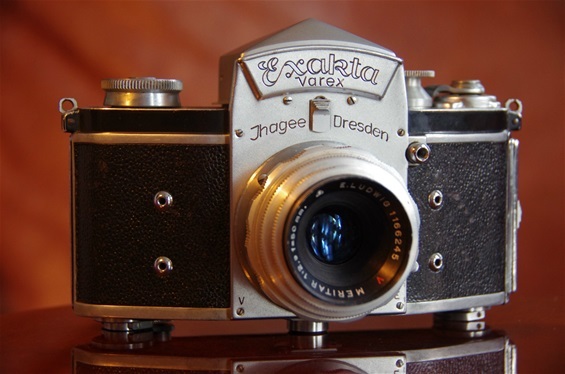 Exakta was still produced for a while, but more like copies of Praktica models. So, two of the most influential producers in the pioneer time of PP SLRs were out of business some 20 years after the start. Exakta Varex penta prism, sn. 679389. 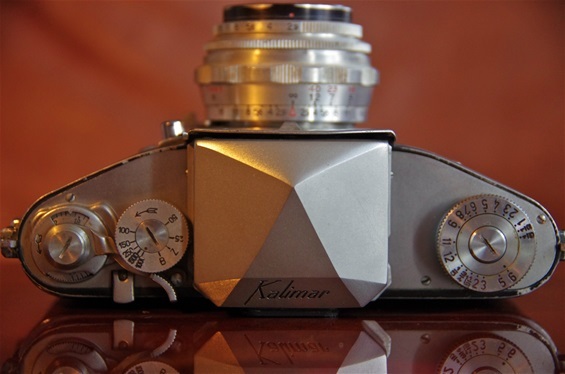 Introduced as PP SLR in 1950 as worlds first with interchangeable finder, with start of series production in February. Size: 152x95x49mm. Weight: 676 grams. VX eye level penta prism introduced the PAD lenses in 1954, to be copied by many, like Miranda, Topcon, Start. 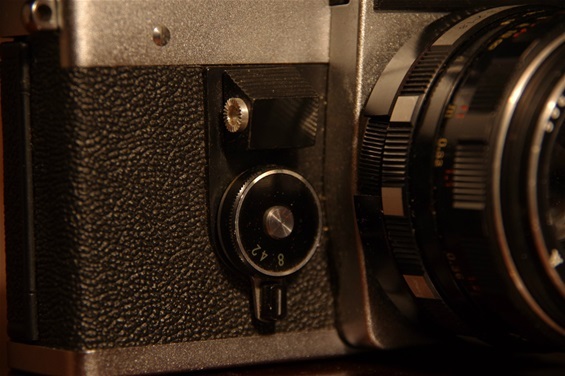 PAD was short for Pressure Activated Diaphragm, which means that by pressing the shutter release button in front, going through an arm on the lens, the diaphragm (aperture mechanism in the lens) was corrected from full opening to preselected value as the shutter opened. This was a more direct method than building a mechanism inside the camera, thus making it possible to obtain this semi automatic feature on elder cameras. Here a house sn. 700771 from 1951 and a PAD lens from '54. Exakta tradition was to build camera houses where the front wall, rather than being parallell to the rear wall, was shaping a shallow V towards the lens. ASA/DIN setting to the right of the camera, shutter speeds to the left. Note that Exakta had a winder arm, not a knob or a wheel, as was usual, but placed to the left. Worlds first winder arm on a PP SLR. 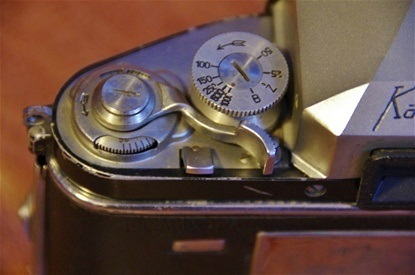 Note that both shutter speed dial and winder is on the left hand side of the camera. 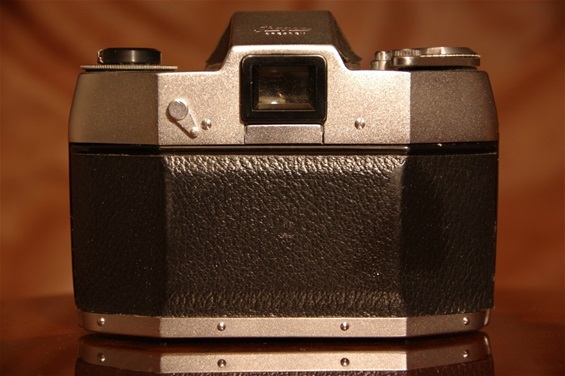 A VX of 1951 with PAD lens of 1954 and A VX with waist level finder. Sn. prism version 700771 and sn. 728522 on waist level version. Both with Carl Zeiss Jena Tessar 50/2,8. The last in the proud Exakta row was introduced in 1969 and produced till 1973. 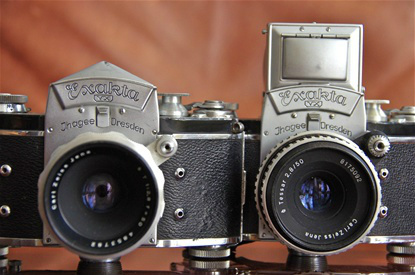 The RTL 1000 was a close to copy of the Praktica L, but with an interchangeable prism and a special self timer. But as a whole, the last Exakta was built on a Praktica house more than the typical Exakta. Therefore some will say this was not a true Exakta, and rule it out as such. Obviously more Praktica than Exakta, although there were some differences at the front. (See next photo). Weight: 647 grams. Size: 145x100x48 mm. Sn. : 275564. Shutter release button and selftimer did not look like the ones on the Prakticas. Very Praktica L from above: the total lay out, except for the interchangeable prism house. Pentacon Auto 50/1,8. Sn. 5861982. 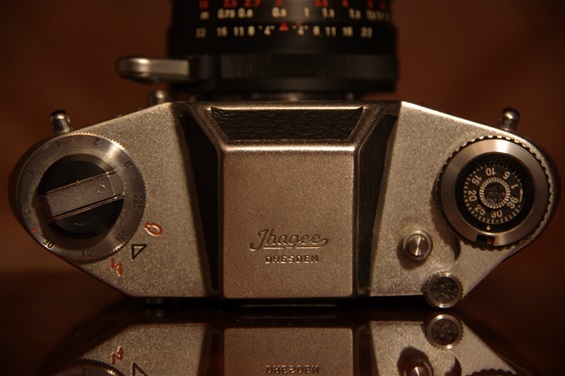 The Exa was a a series of smaller and simpler cameras produced by Ihagee. 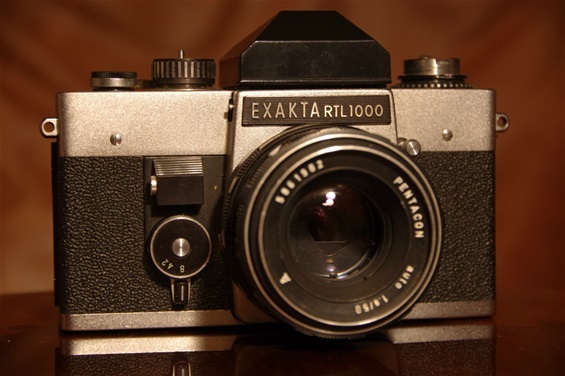 They were introduced in 1951 and were produced until 1985, thus being produced several years after the final production of Exakta. 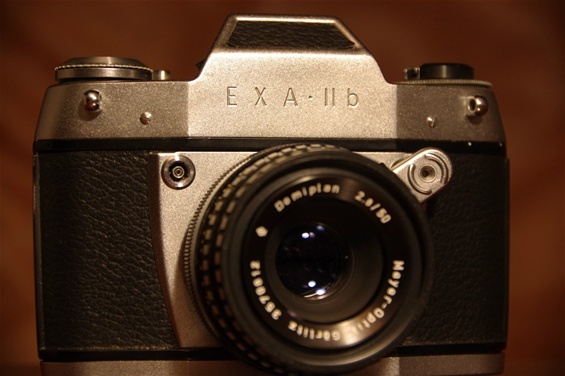 This Exa II b was the peak of the Exa series. Weight: 660 grams. Size: 128x98x48 mm. Sn. : 237431. Shutter time dial to the left shows a range from B to 1/250. Earlier Exas stopped at 1/150 as fastest shutter times. An On/Off handle on the upper back wall opens for removal of back wall for loading. 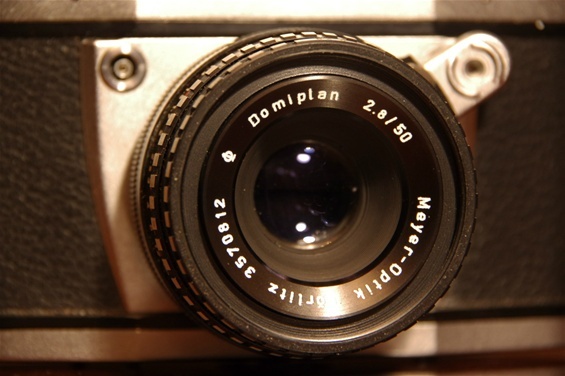 A Meyer-Optik Görlitz Domiplan 50/2,8. Sn. 3570812.